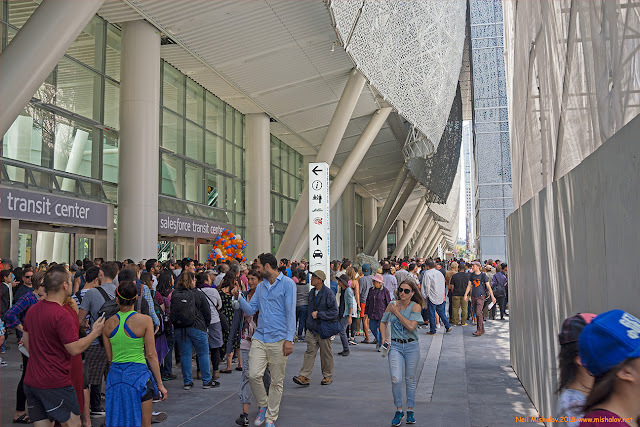 The new Transbay Transit Center, also known as the Salesforce Transit Center, required 20 years of planning, and nearly a decade of construction. The Transit Center is located in downtown San Francisco between Beale Street and Second Street. 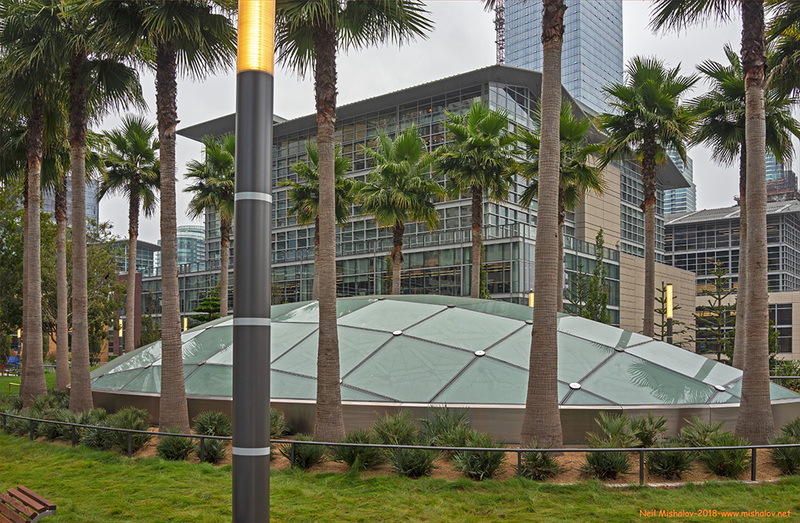 The construction cost of the Transit Center is $2.26 billion, as of 2018. A below-ground concourse level, in addition to a below-ground Caltrain rail link from the southern part of the San Francisco Peninsula, is still under construction. 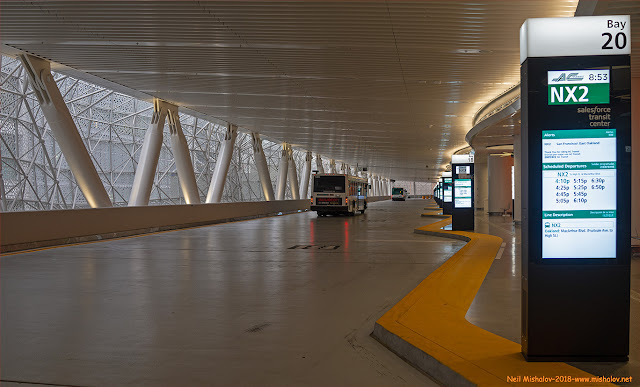 It is estimated that the underground portion of the Transit Center will be completed in 2028. 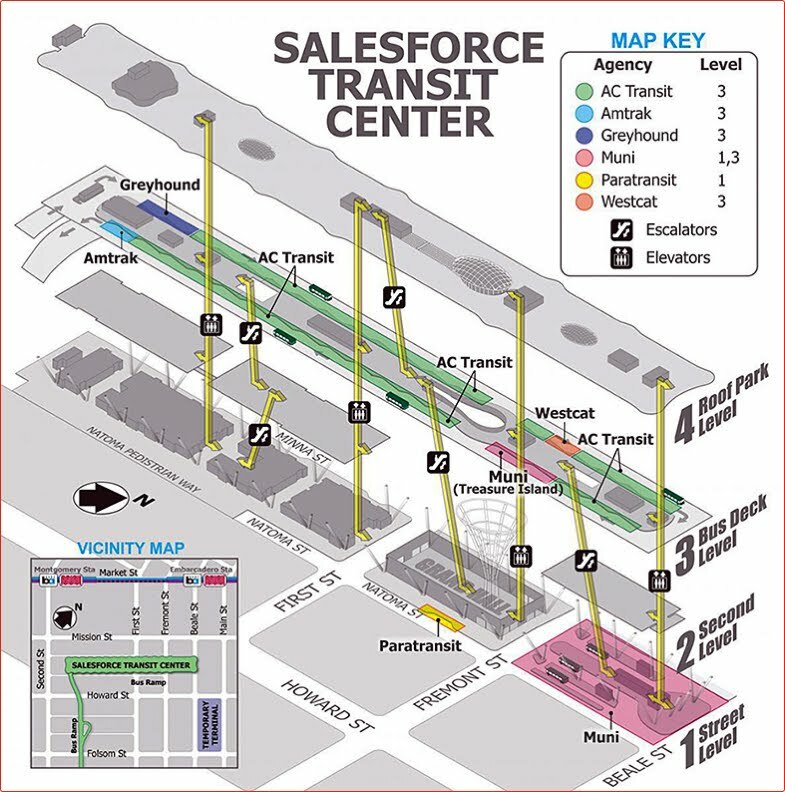 Salesforce.com agreed to pay $110 million over a 25 year period for naming rights to the Transit Center. The Transit Center contains approximately 1.2 million square feet of space, which is spread out across six levels—four levels above ground and two below ground. 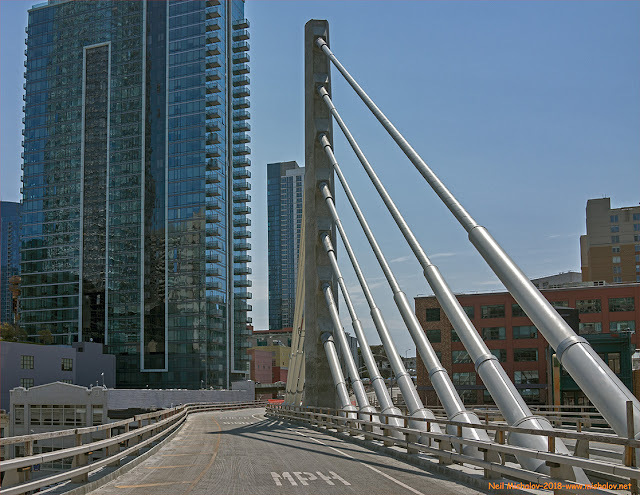 An attractive mini replica of the eastern span of the San Francisco-Oakland Bay Bridge serves as a Bridgeway, which provides the access point for buses heading to, and returning from, the East Bay via the San Francisco-Oakland Bay Bridge. 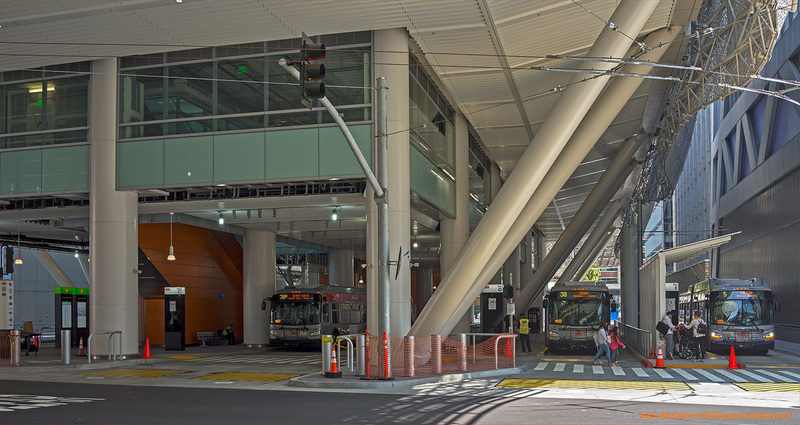 The Transit Center's street-level bus terminal is used by San Francisco Municipal Transportation Agency buses and San Francisco Paratransit vehicles. 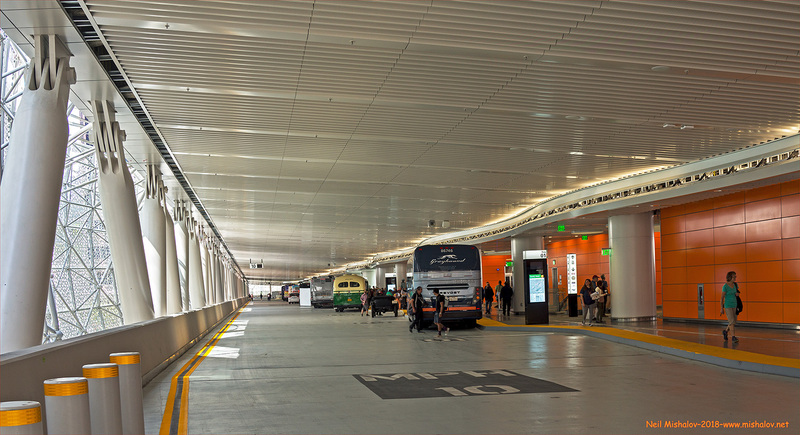 A bus deck on the third floor hosts Alameda-Contra Costa Transit District buses and Western Contra Costa Transit Authority buses from the East Bay, plus Golden Gate Transit buses from Marin County. Greyhound Bus Lines and Amtrak Thruway Motorcoach bus services are also located on the third floor. The Transit Center has a 5.4-acre rooftop park, the length of which is almost three blocks long. 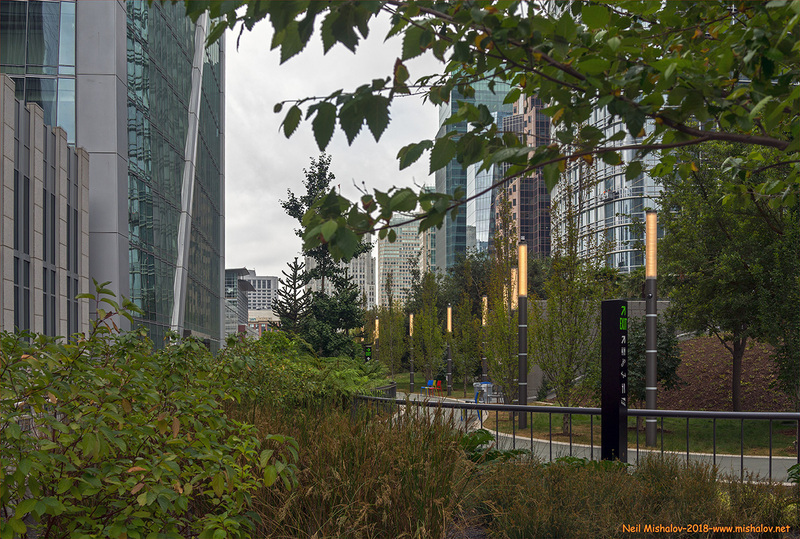 The distance of the walking paths around the Transit Center's rooftop park is 0.55 miles. The park is a delight to behold. 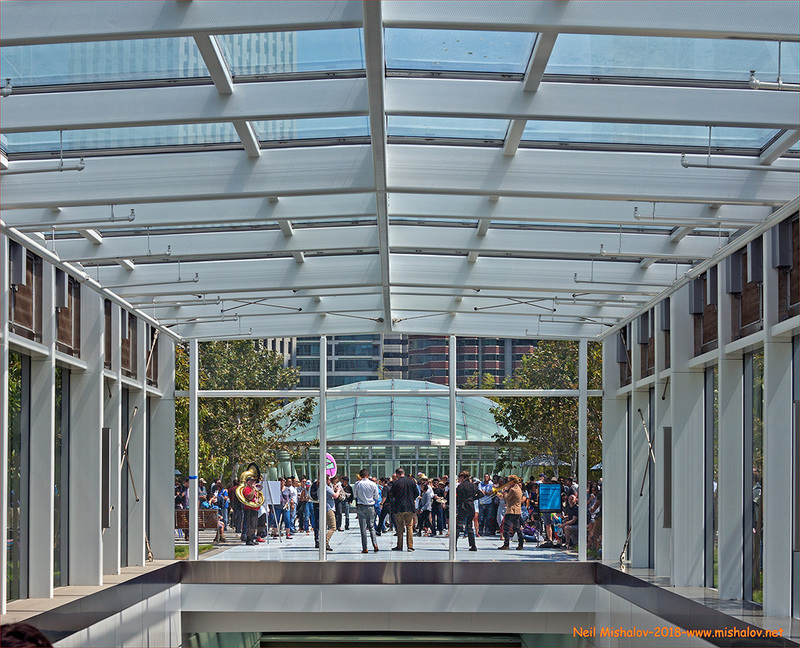 3,992 perforated white aluminum panels make up the exterior facade of the Transit Center. 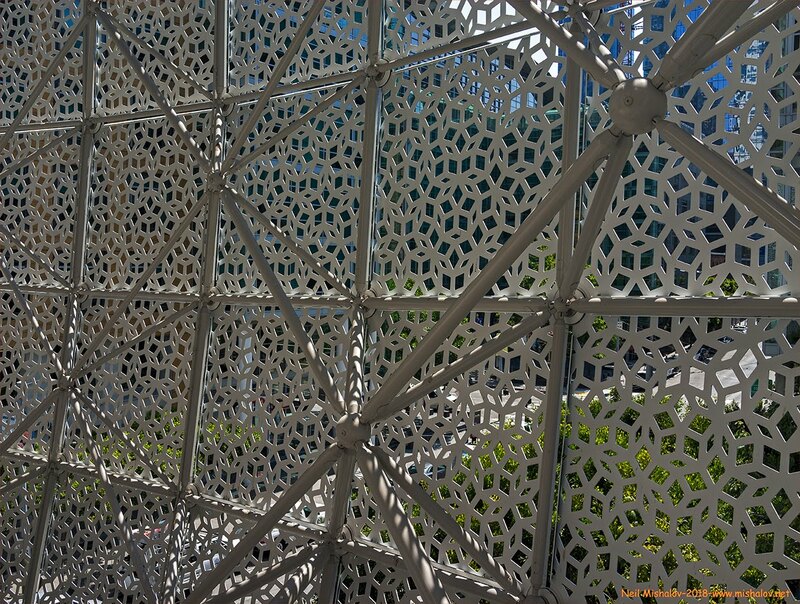 The panels feature a geometric rhombus pattern which was discovered by Sir Roger Penrose in the 1970s. 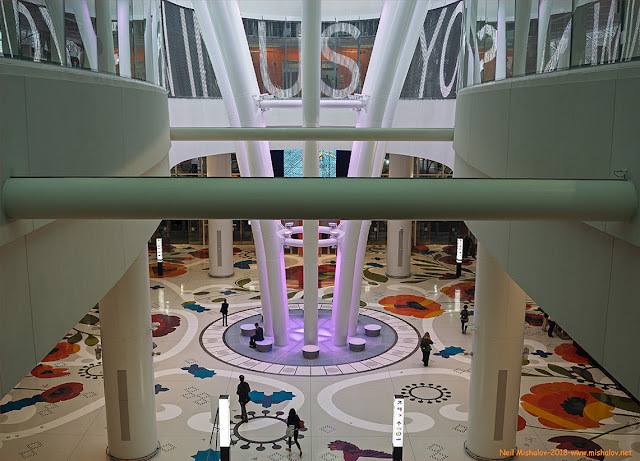 The combined panels are 3,000 feet long and 44 feet tall. This is a view of the bus access ramp between the San Francisco-Oakland Bay Bridge and the new Transit Center. The scene is looking south. 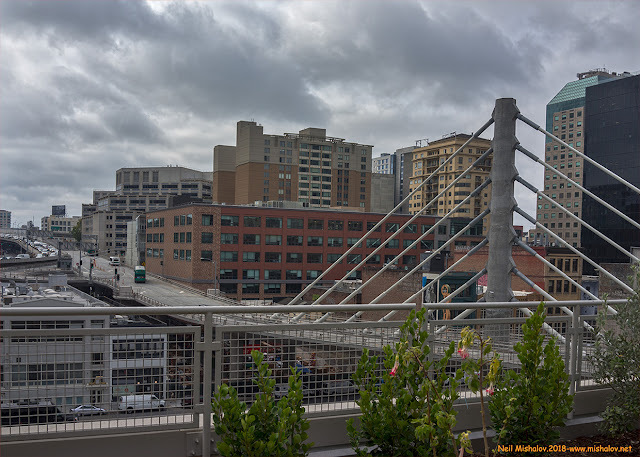 This is a view of the bus access bridge to the Bay Bridge as seen from the park located on the top level of the new transit center. On the bus access bridge. 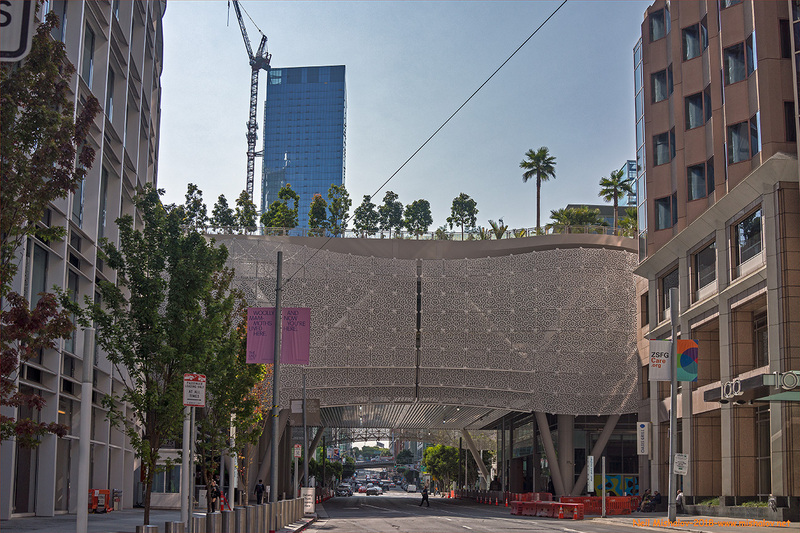 The recently constructed Transbay Transit Center is the second iteration of the San Francisco Transbay Terminal. The first Transbay Terminal occupied the same general location as the current Transbay Center. 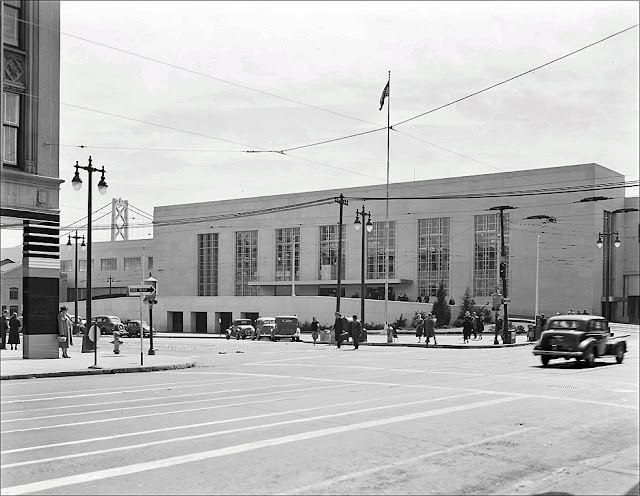 The original San Francisco Bay Bridge Transit Terminal opened on 14 January 1939; Timothy L. Pflueger designed the structure. The original Transbay Terminal served as the San Francisco terminus for electric commuter trains of the Interurban Electric, the Key System, and the Sacramento Northern railroads. The trains traversed San Francisco Bay on the lower deck of the San Francisco-Oakland Bay Bridge. The terminal was converted from a train station to a bus depot in 1959. The tracks were removed, and buses replaced the streetcars. The Transit Terminal mainly served as a transportation destination to downtown San Francisco from surrounding communities of the Bay Area. AC Transit, the publicly owned successor of the Key System, had buses traversing the Bay Bridge. 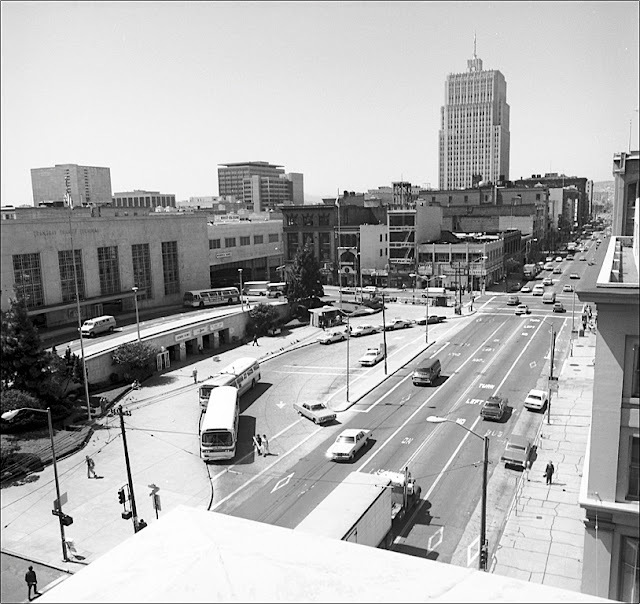 Bus service thrived until late 1974 when BART's Transbay Tube opened. A majority of people preferred to take BART rather than a bus from the East Bay to San Francisco. 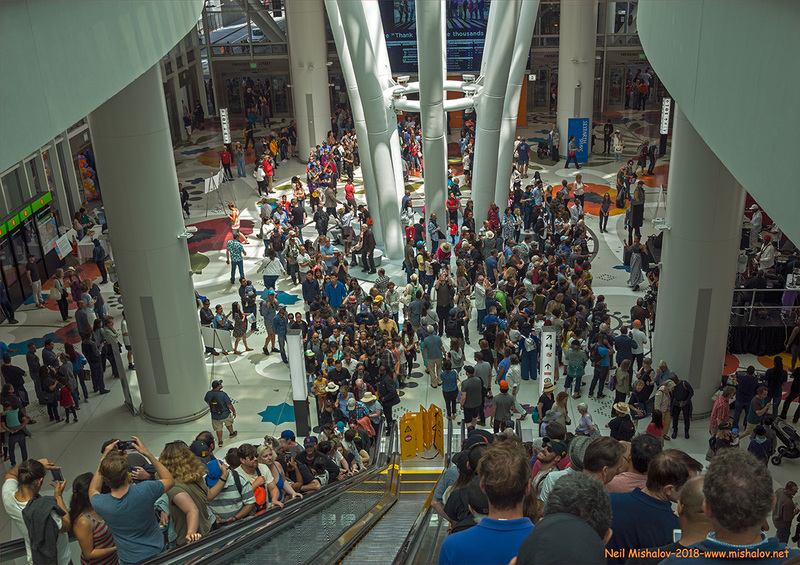 BART is a rapid-transit rail system which has 48 stations along six routes covering 112 miles. 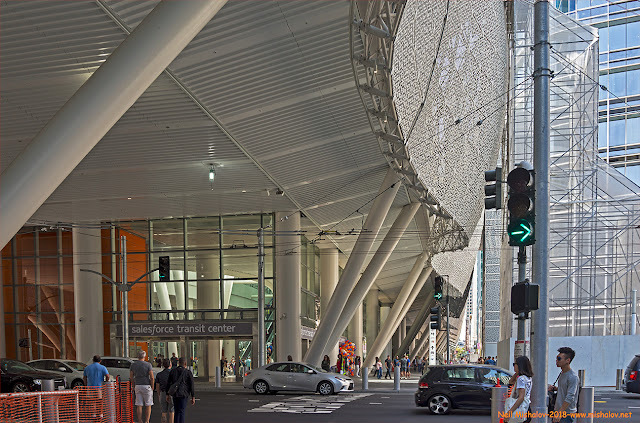 The original San Francisco Transbay Terminal closed on 7 August 2010 to make way for the construction of the current replacement facility, the Transbay Transit Center. 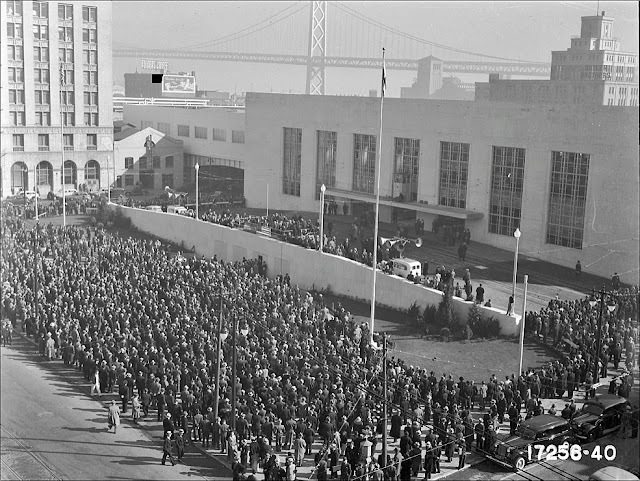 14 January 1939, the opening day celebration of the original San Francisco Transbay Terminal. The western span of the two-level San Francisco-Oakland Bay Bridge is visible in the background. 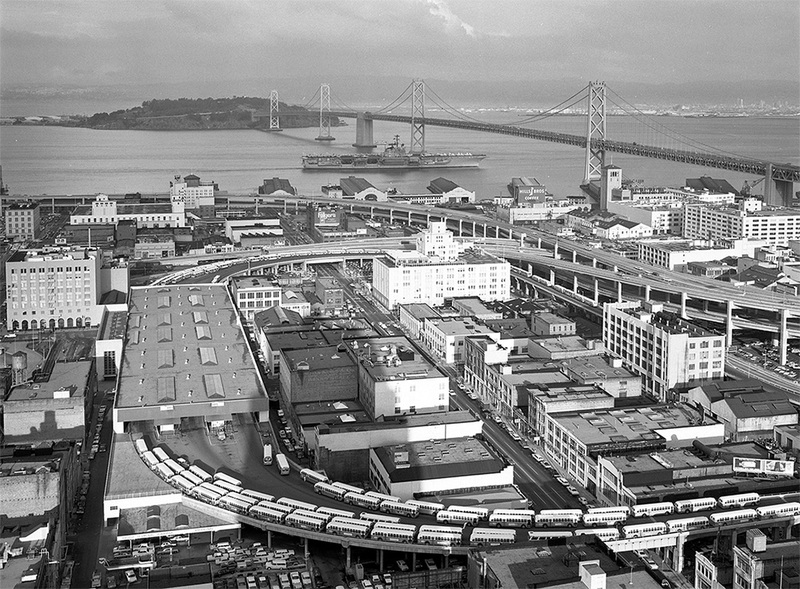 Streetcars traveled between the East Bay and San Francisco on the lower level of the bridge. 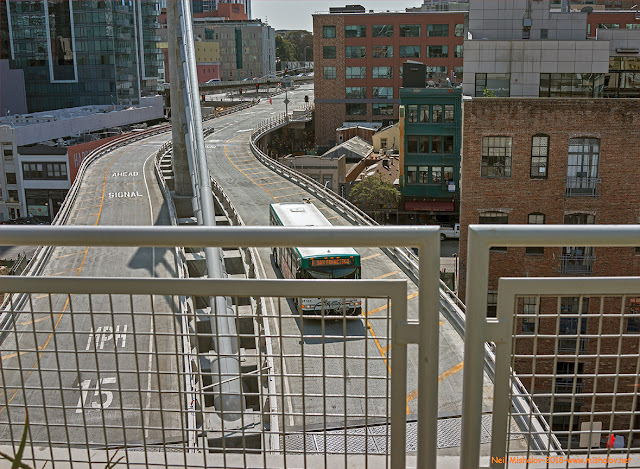 This photo is courtesy of the SFMTA. 16 November 1939, the front of the original Transbay Transit Terminal, shortly after construction. 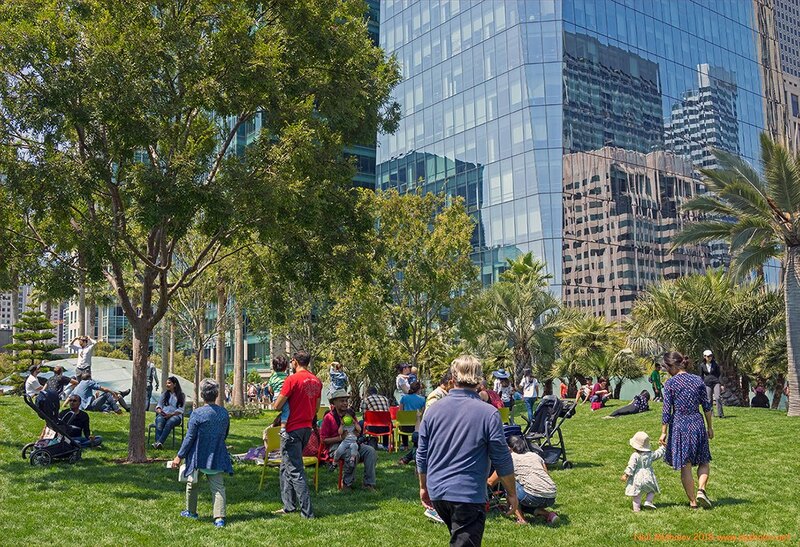 This photo is courtesy of the SFMTA. 27 August 1939, another view of the facade of the original Transit Terminal. 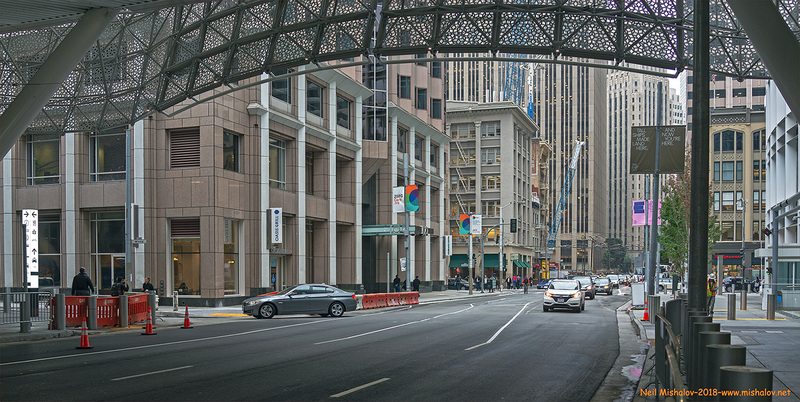 This photo is courtesy of the SFMTA. 28 April 1978, the original Transit Terminal is on the left, and the Pacific Telephone Building is ahead. The view is looking southwest. This photo is courtesy of the SFMTA. 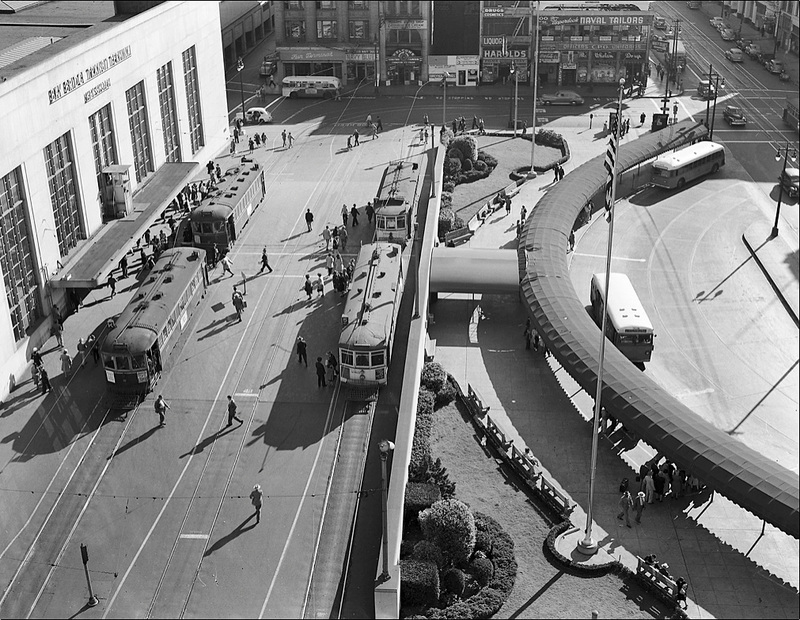 15 November 1965, a photo of the original San Francisco Transit Terminal. When the photographer took this picture, he or she was standing high up in the 26 story Pacific Telephone Building, which opened for business in 1925. The photographer intended to take a picture of the aircraft carrier USS Ranger (CV-61) as it is navigated south through San Francisco Bay. In this picture, the aircraft carrier is about to travel under the western span of the San Francisco-Oakland Bay Bridge. 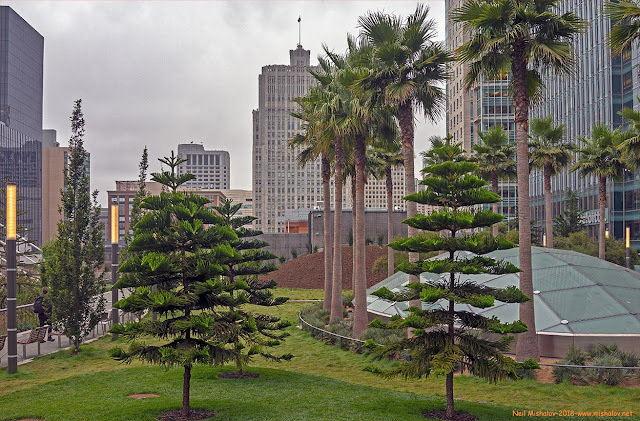 If you look closely at the photograph, you can also see the early evening tall shadow of the Pacific Telephone Building. The view is looking east. This is a schematic drawing of the new Transit Center. Jeremy Menzies is the staff photographer for the San Francisco Municipal Transportation Agency. 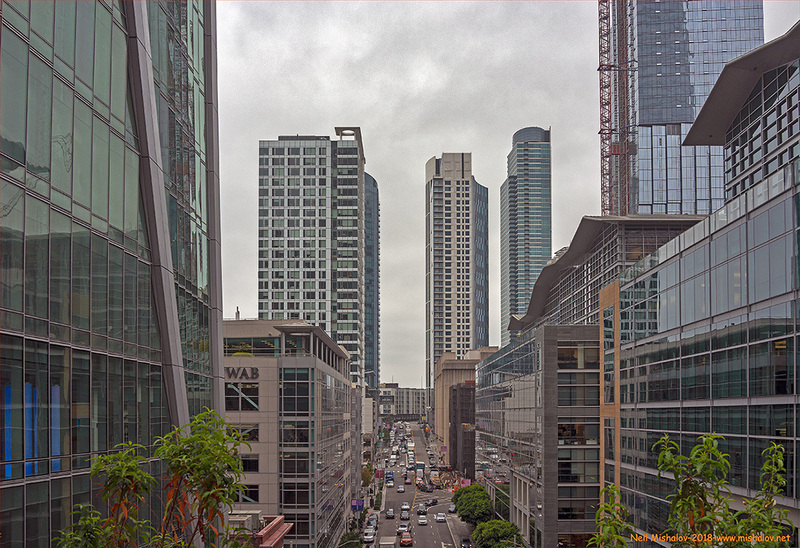 The SFMTA is responsible for public transit in San Francisco. 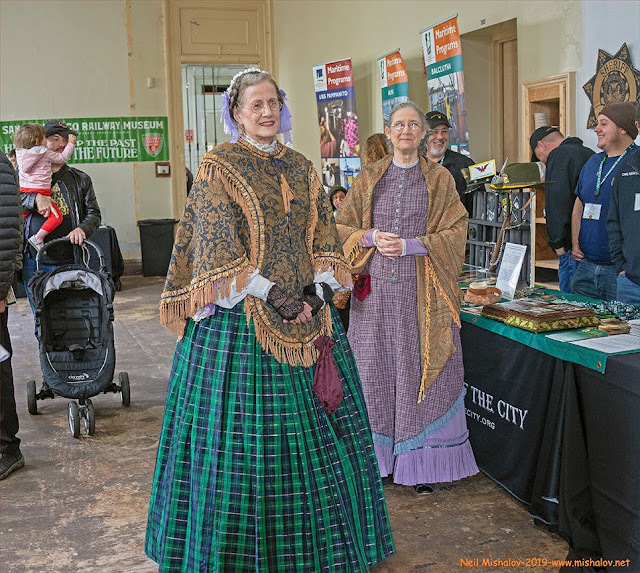 Mr. Menzies is also entrusted with administering the SFMTA Photo Archives, which contains tens of thousands of San Francisco transportation-related photographs from 1903 to the present day. The SFMTA Photography Department & Archive is an excellent webpage from which to view the history of San Francisco in general, and the San Francisco Municipal Transportation Agency in detail. 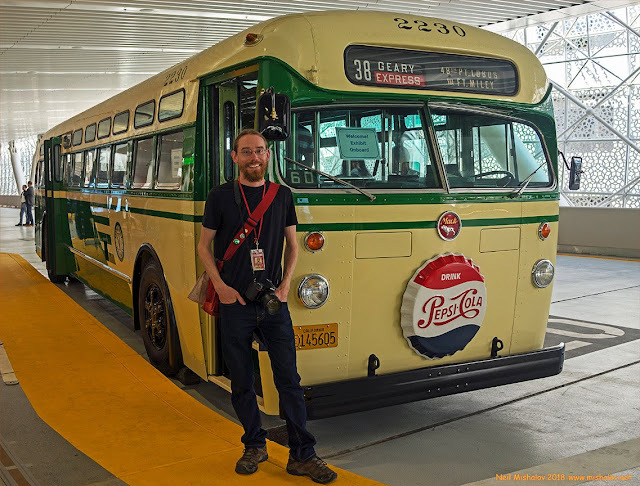 The bus behind Mr. Menzies is SFMTA bus # 2230; it is a recently restored 1956 Mack Motor Coach. And I must add, it is a beautiful restoration. 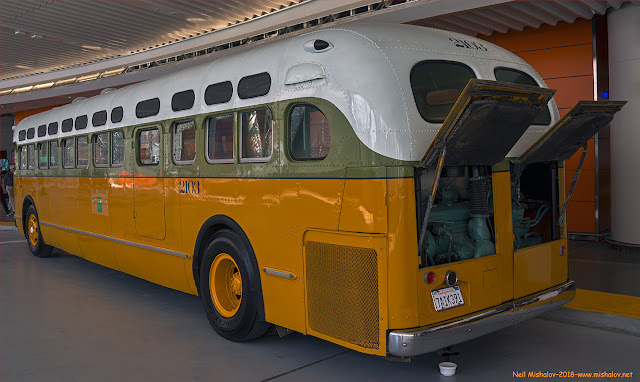 When this bus was in operation, it traveled from the original Transbay Terminal, west on Geary Boulevard to the Fort Miley Military Reservation and 48th Avenue. 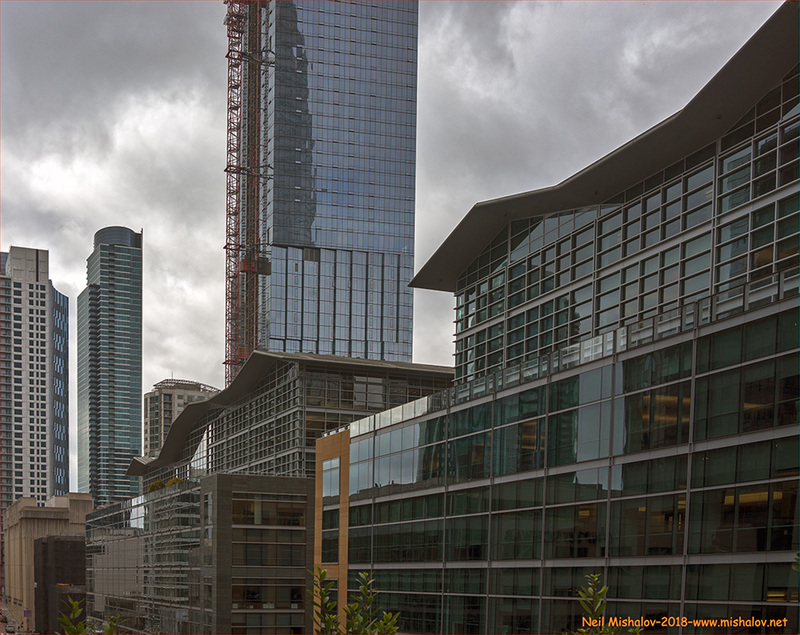 The picture was taken on the third floor of the new Transit Center. This is bus # 2103. It was manufactured by General Motors in 1958, and it was one of twenty-one buses purchased by the Key Transit System. All of the buses were used by the Key System to transport passengers from the San Francisco Transit Terminal, over the Bay Bridge, to a terminal located in the East Bay. The passengers were then able to transfer to a Key System bus or streetcar which traveled to their destination. The picture was taken on the third floor of the new Transit Center. 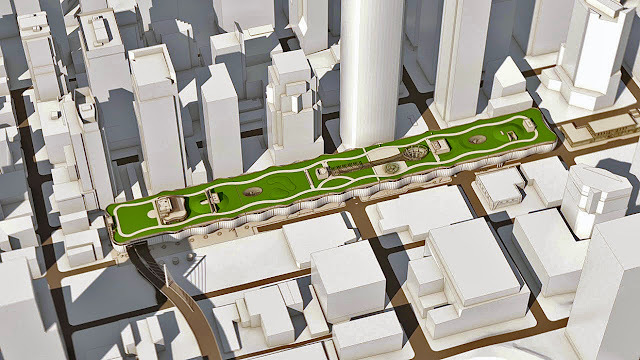 This is an illustration of the new Transit Center. The view is looking northwest and the Transit Center Bridgeway is seen in the lower left portion of the drawing. This is the bus depot located on the third floor of the Transit Center. 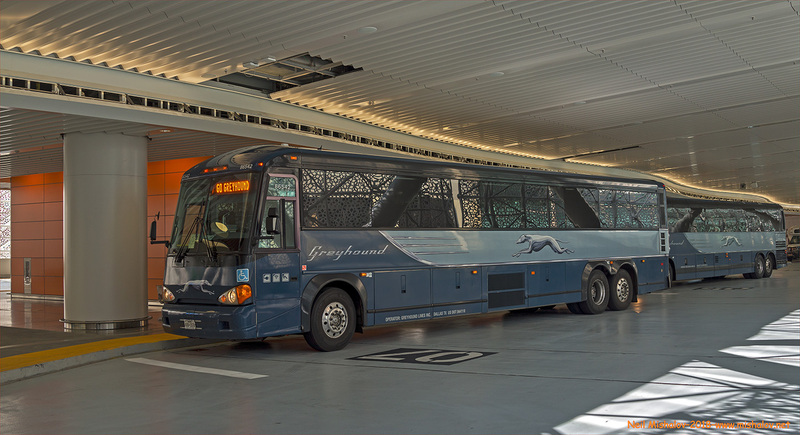 Greyhound buses at the bus depot. On the third floor of the bus depot. A view of the main entryway to the Transit Center. 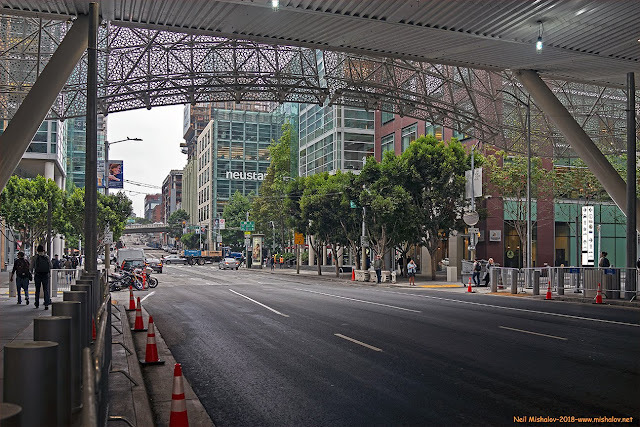 The San Francisco Muni bus terminal is located on Fremont Street at Natoma Street. 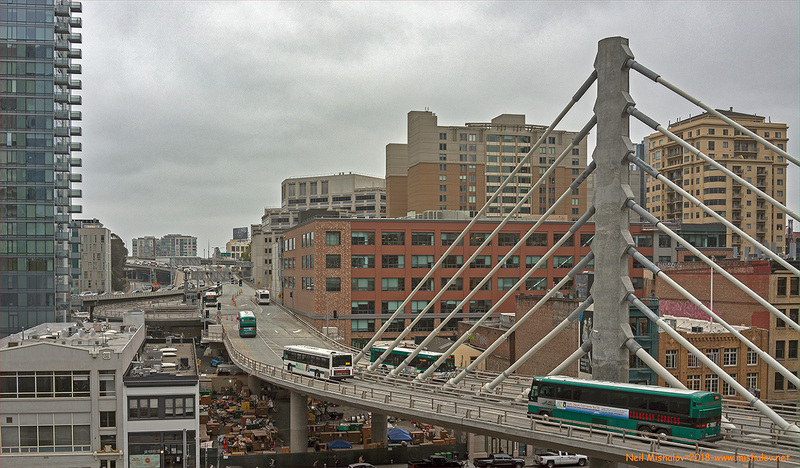 The Transit Center is shown crossing over First Street at Minna Street. The view is looking southeast. This is a view of First Street as seen from under the Transit Center. The scene is looking southeast. This is a view of First Street as seen from under the Transit Center. The view is looking northwest. A street level view of the Transit Center. 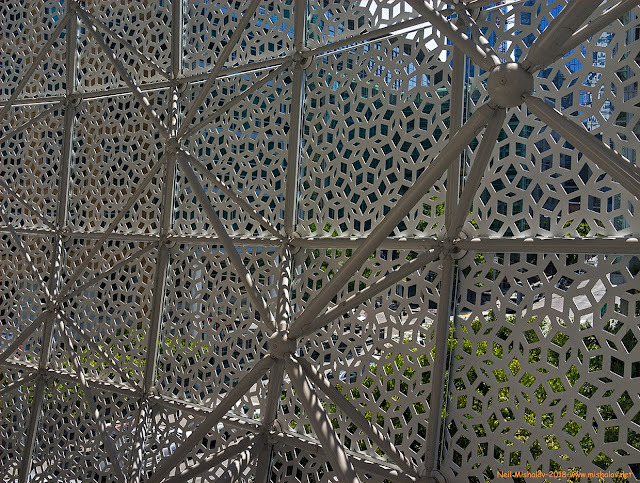 This is a closeup view of the perforated white aluminum panels which make up the exterior facade of the Transit Center. 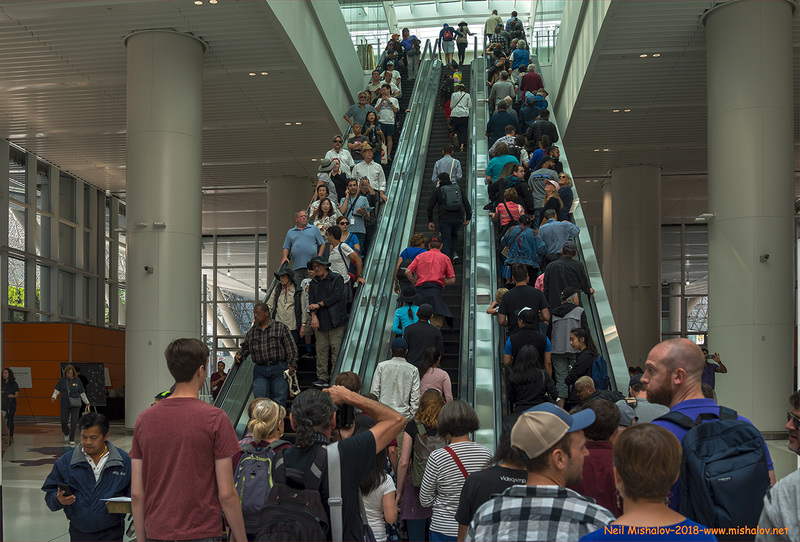 An escalator in the Transit Center. 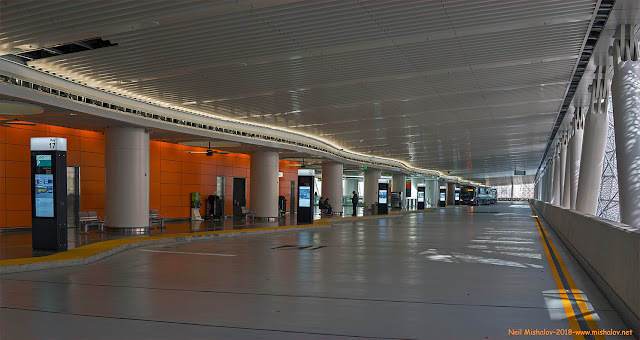 The main ground level entryway to the Transit Center. 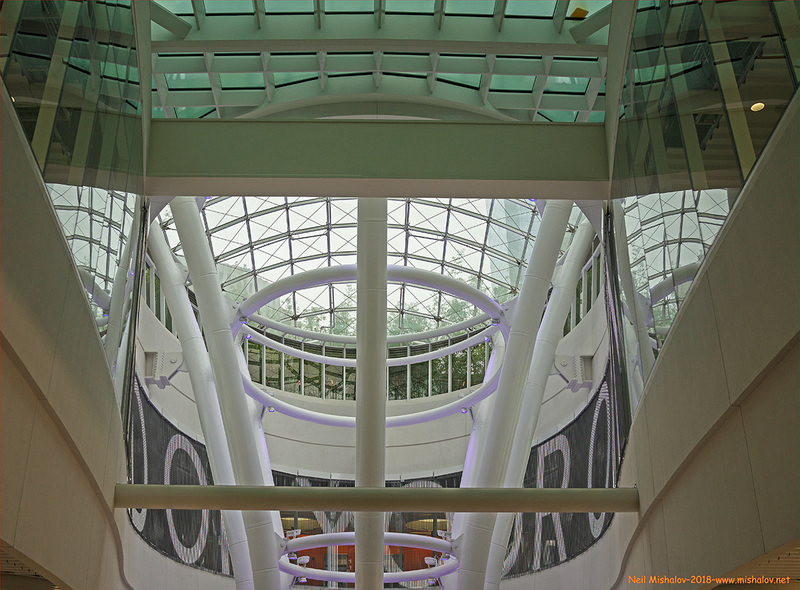 A skylight in the Transit Center. 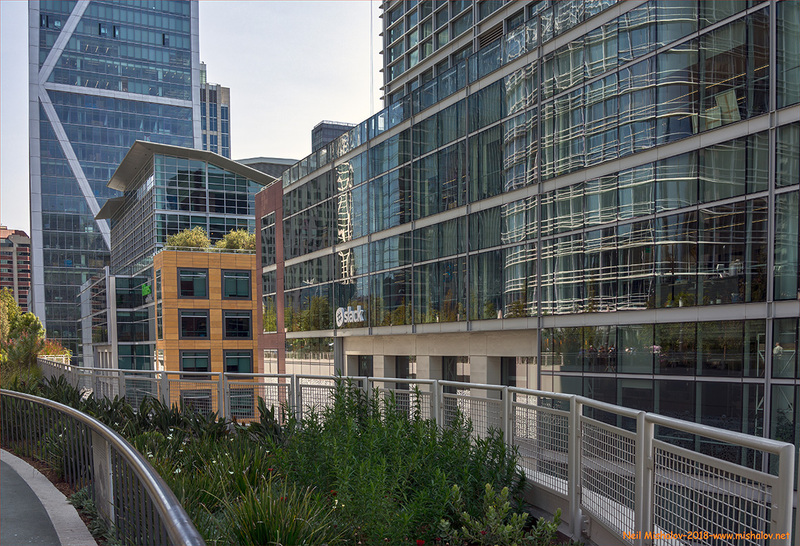 A view of the park sited on the top floor of the Transit Center. A view from the park. 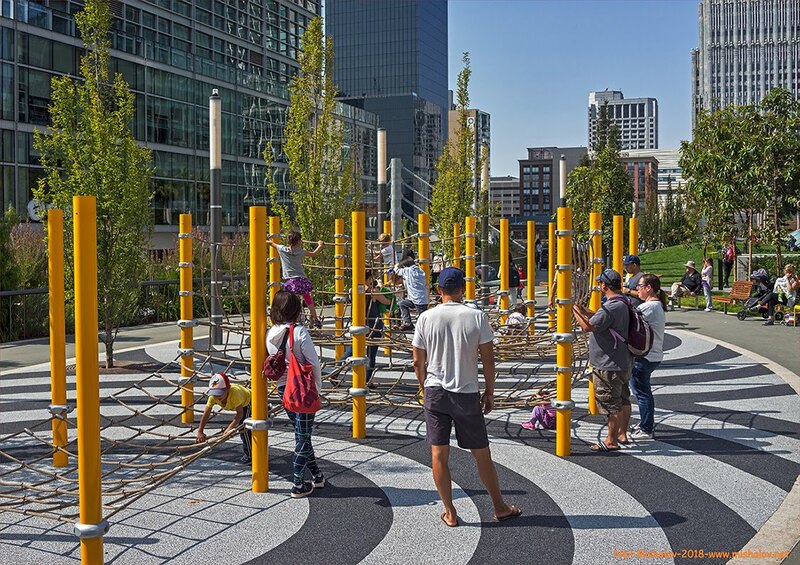 A view of the children's playground. A view of the park. 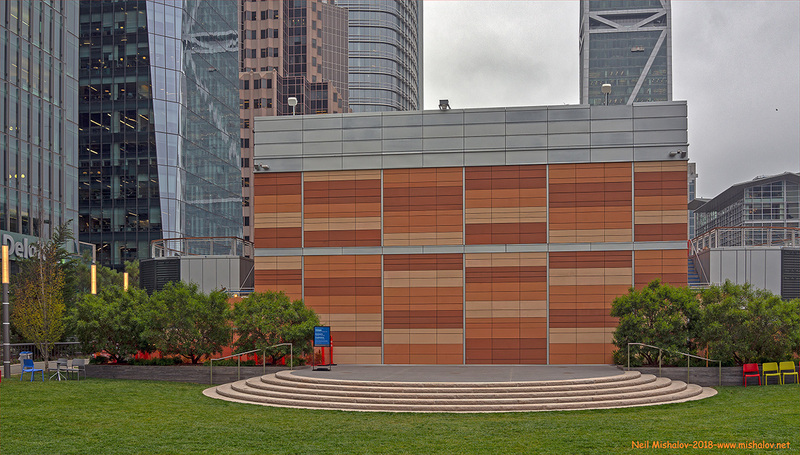 A view of a small stage in the park. 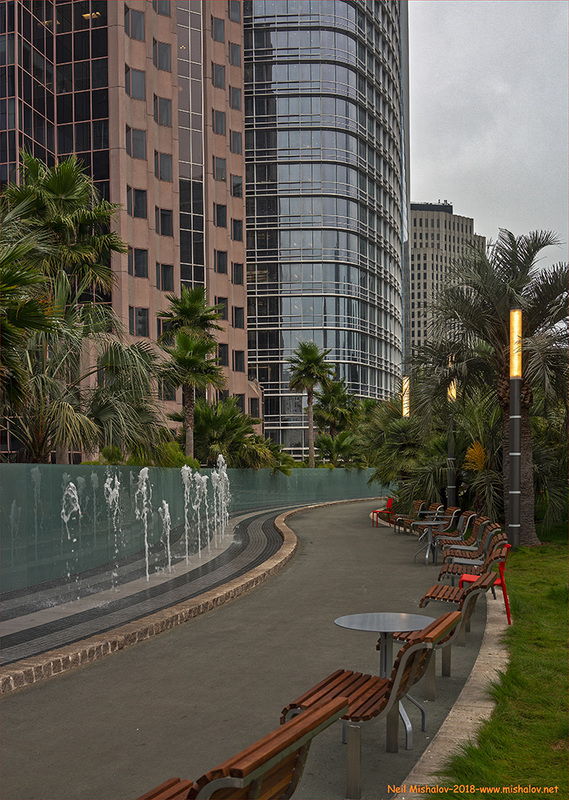 A view of a pathway in the park. A view from the park. The Pacific Telephone Building is straight ahead, with a flag on its roof. A view of the water geysers. A view from the park. Salesforce Tower, aka Transbay Tower, is the building on the left. 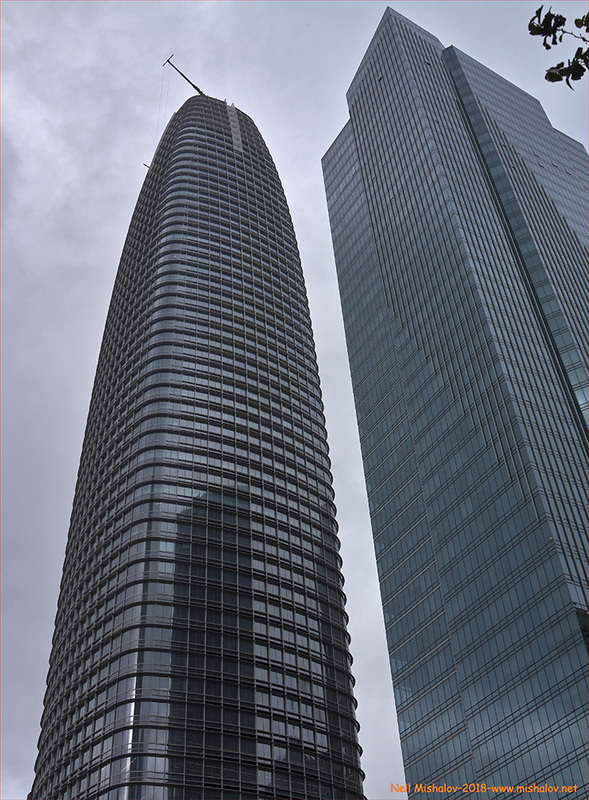 It is the tallest building in San Francisco. A view of the bus Bridgeway between the Bay Bridge and the Transit Center. A view from the Transit Center looking southeast down Fremont Street. 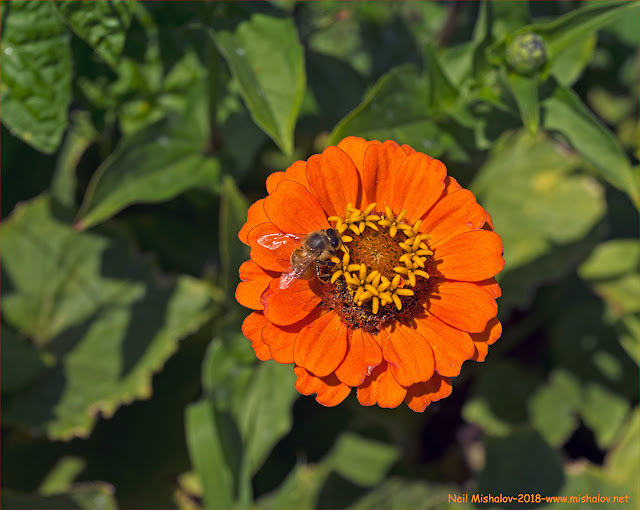 A busy bee hard at work in the Transit Center park.